Wins Grand Prix de Saint Cast! (Saint Cast, France)- The first regatta in the season-long French J/80 Cup took place over the April 28th to May 1st weekend in Saint Cast, France. 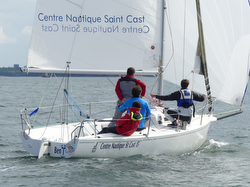 Fourteen J/80s participated in the five-race regatta hosted by Centre Nautique Saint Cast. After a rough start to the series, Patrick Bot’s team (Frederic Hauville, Fabrice Morin, and Ned Bigi) on ECOLE NAVALE CG29 posted a 8-1-1-1-2 record for 5 pts net to win the first regatta. The most consistent team was Luc Nadal’s veteran crew (David Nadal, Yvon Goude, Killan Cabanes) on GAN’JA, sailing to a 2-4-3-2-1 for 8 pts net. Then, an all women’s crew on ECOLE NAVALE CDV29 sailed a beautiful series to take the bronze on a tie-breaker, much to the delight of skipper Elodie Bonafous and her crew of Anne Guillou, Morgane Keramphele, Louise Acker, and Romane Maledant. Losing that tie-break was Tom Dubois’ JUMPER. Then, fifth went to Eric Herve’s CN ST CAST VOILERIE ST MALO. Notably, by finishing third, Elodie Bonafous’ team sit at the top of the women’s standings, leading the Women’s Cup for the season. For more J/80 Grand Prix de Saint Cast sailing information Add to Flipboard Magazine.